Left untended, the Muskrat Falls project threatens the financial well-being of the government and people of Newfoundland and Labrador. The threat cannot be removed merely by directing money from one pot or another to offset the impact the mismanaged project’s costs would have on electricity rates in the province. The threat from Muskrat Falls can only be removed by concerted action that addresses the project’s financial burden, restores integrity to the system of electricity regulation, and that breaks, once and for all time, the fundamentally corrupt relationship between the provincial hydro-electric corporation and the provincial government. This is the only way to restore power to the province’s people so that they may control their own future. Budget 2019 was an election budget in the sense it contained a lot of little goodies, but there was nothing to get overly excited about. While everyone else is focused on the shot-term, the long-term trending contains more interesting tidbits. The following slides update the post from Monday. Budget 2019 forecasts cash spending (capital and current) of about $8.0 billion, about $200 million above the 2018 actual spending. The Conservative and Liberal Muskrat Falls rate mitigation plans are the same. Both include magical assumptions of revenue. Both omit crucial details. Note: Some people asked on Monday for comment or analysis of the two plans to mitigate Muskrat Falls' impact on provincial electricity rates. This is an abbreviated summary of the two plans and some issues flowing from it. A more substantive analysis will come on Monday 22 April 2019 with the publication here of the SRBP rate mitigation proposal called "Restoring Power." The Conservative and Liberal rate mitigation plans are the same idea. This is not surprising since the Conservatives copied the Liberal approach and used the same information from the Public Utilities Board review as the basis for the plan details. Most of the commentary about Budget 2019 on Tuesday will be focused on the short-term. Here are some slides that show longer-term trending. We'll update them later on with the Budget 2019 figures.This is the sort of stuff that bears watching especially since the announcement of a new federal transfer payment came with the unexplained claim that it will magically reduce public debt and return the government to surplus over night. The Atlantic Accord functions in Newfoundland and Labrador politics in two ways. There is the agreement between the Government of Canada and the provincial government that established the joint management framework for the Newfoundland and Labrador offshore. At the same time, there is the political prop and the associated mythology that has, in largest measure, replaced the actual agreement in both the popular and political/bureaucratic understanding of it. Neither the 2005 nor 2019 federal-provincial agreements commonly referred to as the Atlantic Accord or revised Atlantic Accord had anything to do with development and management of the oil and gas resources offshore Newfoundland and Labrador. Neither changed the 1985 agreement directly or indirectly. The widely-held belief is completely different. The popular misconception comes from the fact that in both cases, the premiers faced with financial difficulties linked their demands for money from Ottawa to the Atlantic Accord. In both cases, the issues were about something else. In 2005, the discussion was actually about Equalization. It 2019, the final agreement was about financial assistance for the provincial government about its own financial difficulties and to deal with the troubled Muskrat Falls project. The Atlantic Accord ended a decade of often acrimonious dispute between the federal and provincial governments over offshore oil and gas resources. The province had initially staked its claim to ownership of the resource in 1975, based on the premise that Newfoundland and Labrador brought the resources with them at the time of Confederation and had retained jurisdiction over them. The Supreme Court of Canada ended the dispute in its decision on a reference from the Government of Canada. The Court found that, for several reasons, the right to explore and exploit offshore resources and the legislative jurisdiction to do so lay with the federal government. The court decided that, in addition to other considerations, control of the offshore was a function of Canada’s international status. Under the Terms of Union, this part of Newfoundland’s pre-Confederation legal status transferred to the federal government. The Supreme Court of Newfoundland and Labrador Court of Appeal addressed a reference from the provincial government that also concluded the federal government had jurisdiction over the offshore. Saturday morning and Facebook delivered a video clip of Peter Mansbridge accepting a lifetime achievement award. After the obligatory thanks to everyone, Mansbridge delivers a scripted couple of minutes about journalism in the age of fake news and alternate facts. "Journalism is under threat," Mansbridge warned, "in a way we haven't witnessed before." "The very principle that we stand for is under attack." Finding truth and presenting truth is important, according to Mansbridge. Challenging power and those who wield it is important for "power unchallenged too often becomes power abused." On the eve of an anticipated election call, voters in Newfoundland and Labrador turn up their noses at everyone currently on the field. The latest MQO poll for NTV shows why no one should discard the people who don;t pick a party when asked who they would vote for. When asked which party, they would vote for if an election were held tomorrow, a majority - 56% - said either that they would not vote, refused to answer, or said they were undecided. Liberal support dropped five points from the previous MQO poll, going from 26 to 21. 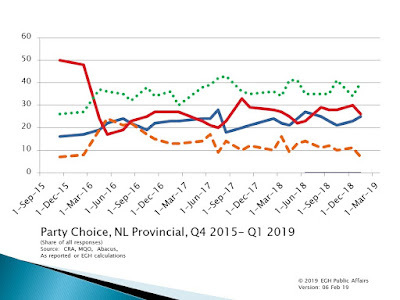 PC Support dropped from 25% to 18% and NDP support sank to four percent. The party defectors all went into the bag of supposedly undecided voters. It looks much more like they were opting for "none of the above." Effective public policy must be based on a clear understanding of the problem and its relation to other issues, as well as public needs and behaviour. There's the problem, defined neatly. The quote is from Municipalities Newfoundland and Labrador's campaign against plastic shopping bags. Put the quote in a search engine on the Internet and you will turn up all sorts of places, including news stories, that use that phrase or a slight variation on it in coverage of the popular campaign to ban plastic bags from the province. Here's an example from The Telegram in 2017 and another a couple of days later that went province-wide. One small question: what's the source for the statistic? "Deep Dive" is the name that Saltwire gives to its new series that is supposed to give readers supposed to give readers more information on specific topics that are of concern across the Atlantic Canada. The series gives Saltwire a way to produce unique content using all its resources in Atlantic Canada, thereby lowering the burden on any one newsroom. Saltwire hopes the Deep Dives will generate new income for the chain. In future, Deep Dives will be accessible only to subscribers. The rest of us will be blocked by a paywall. It's a business model that has worked successfully at major newspapers, which have either halted declining revenue from subscriptions using paywalls or seen revenue growth to offset the losses from the old cash-cow advertising. It might work. The real question is whether Saltwire will produce the content that will make readers dig into their pockets. So that makes you wonder how deep is the deep dive? 1. The myth of the strong leader by Archie Brown. 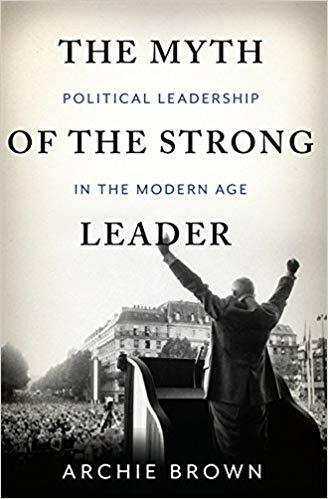 Archie Brown challenges the widespread belief that 'strong leaders', dominant individual wielders of power, are the most successful and admirable. Within authoritarian regimes, a collective leadership is a lesser evil compared with a personal dictatorship. Within democracies, although ‘strong leaders’ are seldom as strong or independent as they purport to be, the idea that just one person is entitled to take the big decisions is harmful and should be resisted. Examining Franklin D. Roosevelt and Mikhail Gorbachev, Deng Xiaoping and Nelson Mandela, Margaret Thatcher and Tony Blair amongst many others, this landmark study pinpoints different types and qualities of leadership. Overturning the popular notion of the strong leader, it makes us rethink preconceptions about what it means to lead." With so much changing in any office, what has "always" been done really only goes back to the time of the last person who came in the door. In Newfoundland and Labrador, the provincial government has been censoring laws since 2012. That's sounds absolutely insane to anyone in the province and outside, but that is undeniably the case. Orders-in-Council are a type of law. They are the decisions of the Lieutenant Governor-in-Council under powers granted by specific laws or from something called the Royal prerogative. They are public documents and in every Westminster-style government they are published regularly, without any form of redaction or censoring. Even in Newfoundland and Labrador, the idea of secret laws in a democracy would be downright sinister if it wasn't for the comical way the whole nonsense started and the reason it carries on.